Malawi’s leading mobile operator Airtel has pumped in K15 million towards the Malawi National Football Team (the Flames) 2017 African Cup of Nations. Speaking during the presentation ceremony at Chiwembe Technical Center in Blantyre on Tuesday morning, the company’s acting Managing Director Charles Kamoto, said the decision comes as a celebration of the attainment of 3.5 million on the leading network in Malawi. “Millions of Malawians are football fanatics, and yes, millions of Malawians are proudly on Airtel network. Football unites us all, the game of soccer entertains us all no matter the hard times. With adequate investment in the sport, the Flames could bask in the glory of success over and over again,” he said. He further promised that Airtel is willing to invest bigger and better in the development of football at all levels. 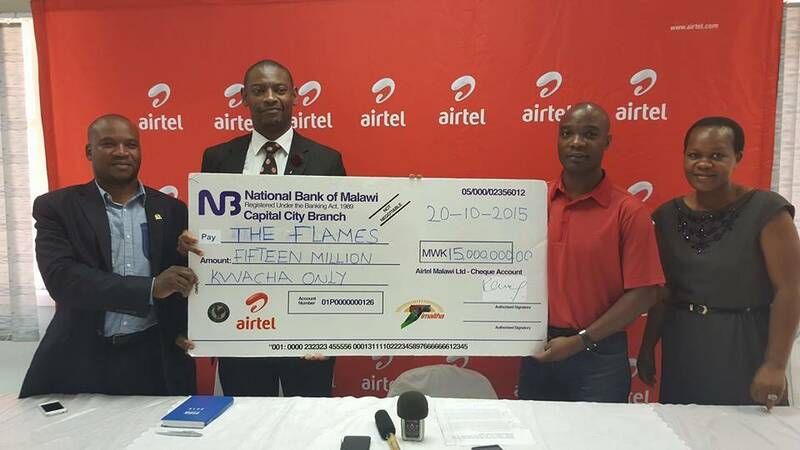 Airtel Acting Manger Charles Kamoto (In red) hands over the dummy cheque to FAM President. “As you aware that we are also sponsoring the Airtel rising stars so that we can nature talent from the grass root level. This massive investment should be visible in all leagues so that quality triumphs as far as soccer talent is concerned and as a company, we are willing to continue investing in the beautiful game of football,” he explained. He said that the donation comes at a time when the Flames are awaiting to participate at CECAFA games in Ethiopia between November and December. “Several games have been lined up for the Flames to participate in such as CECAFA before playing Guinea in the next Afcon qualifying match. As a company, we reckon that all these activities call for the corporate world’s support to the team hence our coming in. We therefore asking the community to join hands in supporting the team financially,” he concluded. On his part, the Football Association of Malawi (FAM) President Walter Nyamilandu hailed Airtel for the donation saying it is a massive boost towards the team’s preparations for the upcoming games. “They are proving to us that they are indeed genuine partners in football and this donation is a massive boost towards the team’s CECAFA games as well as the crucial Afcon qualifier against Guinea next March. I won’t be surprised to see Airtel becoming a full time Flames sponsor because they have been knocking at our door for quite sometime,” he concluded. The Flames are on third position with a point from two games they have played in Group L so far and if they are to make it to Gabon, they must win all the remaining games. Timu iyi siidzantheka. Kungowononga ndalama. Flames si team yoyionongela dollar mukanafusa kaye athu mamizimu akudya gaga bwanji simunakapange donate kumeneko mungofuna kutchuka basi zamoyo wa muthu mulibe nazo mxieeeeew go to hell….!! Apatseni ndalama zo asewerere Mpira makolo awo akugona osadya mmakwalalamu . What is the problem of airtel donating funds to the Flames? Airtel ikufunafuna itayambitsa chikho cha matimu asuper leaque koma chifukwa cha ndondomeko za TNM. Team yokanikayi? ?Why not feeding the most vulnerable Malawians?All r failures maybe??????? Put more on Queens not on flames,until they start to deliver. Do flames play netball?i wonder because its the same fam which said that no competing companies should sponsor ftball,greedy pple u know that u’ll pocket something,evil leaders.u stopped the same conpany from sponsoring a team,why change the goal post now? Airtel inu mukanafusa kaye nanga. Kumaona zinthu zake zothandiza shaaaa. Ndi flames yomwe? Bolatu mukanapanga donate ku prison kapena mmidzimu. Big Hand To Airtel Malawi Chitsanzo Cha Macompany Abwino Okondamasewera Osaiwala T N M Chonde Chende Ku Malawi Macompany Akuluakulu Alipo Koma Sathandiza Chilichose. Watch Out Macompanyamenewo Ku Malawi. Please disolve this so called Frames. Xieewww osakathandiza anthu nzipatalamu bwanji.olo anthu ovutika m’mamidzimu..
Boladi kupatsa flames , ajawa akanapititsa ku ujeni U……………….!!! Missed opotunity y asociate wth a losin brand? Y nt try BB the winin brand! Osangopasa anthu agulire chimanga. Ku Malaw kuli zampiraso? Bola zisabedwenso, paja cashgate yalowa kumpira! !